If we ever experience a mental 'blank' It's when we're trying to figure out what things you need for the beach. Plus, how to look good and feel good while you're lounging in the sand. Even if only for a day, I have rounded up a few tips to share and items you'll be interested in bringing along. If we ever experience a mental block, it's when we're trying to figure out what things you need for the beach. Plus, how to look good and feel good while you're lounging in the sand. Even if you are only visiting for a day, I have rounded up a few tips to share with items you'll be interested in bringing along. So keep on scrolling, because the pieces you're about to see are stylish, attainable and just may surprise you. While checking off each of the things on the packing list, I visited one of my go-to fashion sites Rockflowerpaper.com for the following kimono scarf, cover up, tote bag, and dopp kit to carry my toiletries or my phone, and I added a cute beverage bottle. After discovering Rockflowerpaper last summer, it became a no brainer for me to find what I needed. Most importantly because, I enjoy supporting a company that sells fashion with a cause, as well as home goods designed and owned by women, for women. Ensuring responsible manufacturing of their products in Asia was also one of the brand's standards which captured my attention. When planning what things to take to the beach getaway or a day staycay just keep in mind what you'll be wearing on the sand, like your swimsuit with kimono scarf. Your basics such as the sandals, hat, makeup and sun protection or spf lotion; Then, what you'll want to don for lunch or cocktails like the dress coverup. It's all about relaxing and not having to stress over your style. Did you know? you can repeat wear your cover ups on day 2 by alternating the time you use them. 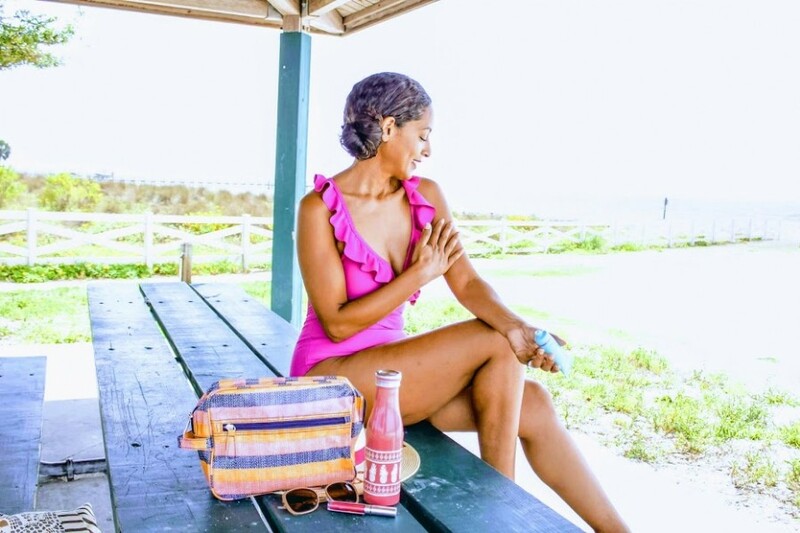 See how I wore the pieces I favor on a recent beach day. Make note that I am 5'3", so I tend to wear longer items with a little bit of height in my shoes. Don't forget to shop them just by tapping. Hope your mind is at ease about what to take to your getaway. Knowing that you're going chic and you've got the right things in your carryall is the start of fun, rest and relaxation.